beautiful card Sylvie, loving the Pink ! Pretty, pretty!~ Pink must be a hot color this year. It is showing up in a lot of challenges. I wondered why we hadn't got an "al-fresco" shot LOL!! That's a great way to use a bauble on a card! Great finished look. No wall to wall sunshine here. Heavy rain bashing onto the windows at the moment. I hope it is heavy enough to give them a bit of a clean LOL!!! Oooh wow - I love that spinning bauble - what a fab technique!! Gorgeous card and love that embossing too! Thanks for sharing with us as In The Pink this time... hope to see you again soon! Simply gorgeous hun, and veru clever! Hugs Sxx PS. Chuffty cold in the UK! Hi Sylvie, what a fabulous design. 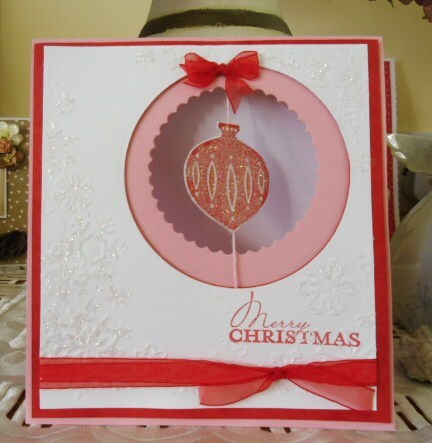 The spinning bauble is such a brilliant idea, and looks wonderful in Pink! Hi Sylvie, gorgeous card! Love the colour and the bauble looks lovely.